Holiday gifts for employees are an American tradition—for Thanksgiving, for Christmas, for any Holiday. 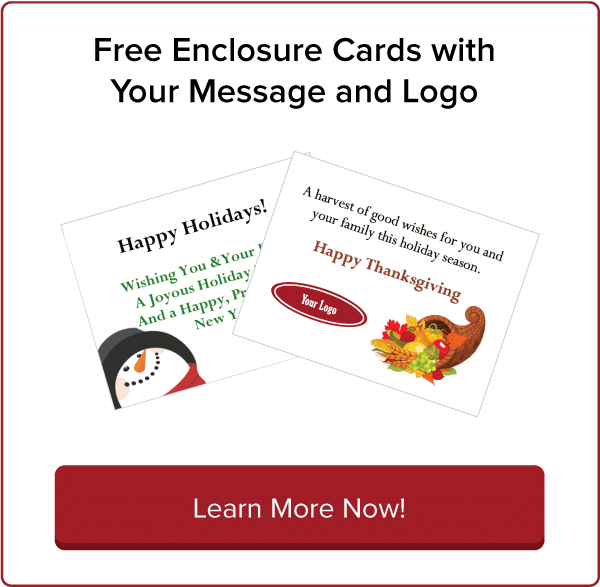 Turkey Gift Cards from gThankyou are a favorite business gift. gThankYou Gift Cards let employees choose any whole turkey — any size, any brand, from any grocery store and bring it home anytime they want. Employees can choose a turkey that is organic, heritage, a tom or hen, fresh or frozen. Using our Gift Cards is easy. First, employers distribute our Gift Cards to employees. Then employees redeem the Gift Cards for a whole turkey at any supermarket. Purchase gThankYou Gift Cards online or by telephone usually takes less than 5 minutes. gThankYou can ship your Cards overnight. Distributing Cards is easy, too. Many companies enclose gThankYou Gift Cards them with payroll; often with a "thank you" letter from the group or company leader. They are the perfect choice for vendors, customers and family, too. Employees do the rest. They choose the turkey they want, from any store they want, anytime they want, then redeem the gThankYou Gift Card at the cash register (just like a cents-off coupon). gThankYou Certificates are simple and convenient. Purchasing employee Holiday Gift Cards from gThankYou is easy and fast. Free Extras. Most of our customers want their company name imprinted on gThankYou Gift Cards — there is no charge for this service. We can also imprint the names of Recipients on gThankYou Gift Cards — and there is no charge for this service either. Fast. Your time is valuable. That's why we work quickly and accurately. Ordering Our Holiday Employee Gift Cards online usually takes about 5 minutes. 100% of the orders we receive are shipped within 24 hours of the time they are received. Many of our customers choose overnight shipping. In many cases gThankYou Gift Cards are received the day after they are ordered. Just inform us of your deadline and we'll meet it. Complete. You receive a detailed order summary shortly after you place your order. On time. We never miss your deadline — period. At gThankYou we work hard to make it easy for you!